Remember when you could almost predict when your car battery was going to die? Aside from the ultimate demise of your battery’s lifespan, you never had to worry about your car being unwilling to turn over when you were ready to drive. Did you remember to turn off your headlights and interior lights? Great, you didn’t have anything to worry about. You rarely got stranded anywhere unless you didn’t know your battery was nearing the end of its lifespan, and nothing was drawing much power. Then, things slowly began to change. Cigarette lighters began drawing charge even after cars were turned off for the evening. We began using power for our MP3 players, bluetooth devices, and cell phone chargers. Cars began offering multiple USB ports, and oftentimes you could plug a hub into those ports so that each port also charged multiple devices. Even laptops could be charged while traveling, which had reliable internet access because they were tethered to portable networks or cell phone data. All of this began taking a toll on battery life expectations. It made it harder to predict when the battery might run low on power. This is especially true for road trips, where cars will often remain idling as someone takes a quick bathroom break or snack trip and draw power even while the engine is off for extended periods of time, like when you’re so exhausted you just need to stop for a power nap. This is why an essential part of roadside emergency preparedness now includes a car jump starter. A jump starter can be used to restart a car instead of waiting for a kind stranger to stop and help. Jump starters provide a quick shock to a car’s battery to give it enough charge to turn over the engine. Once the engine powers back on, the alternator can kick in to begin recharging the battery. I have done a lot of research to help you find the right jump starter for your needs. I endeavored to answer the common questions about what each feature is and how it relates to your purchasing decision. If words like ampere and volt mean nothing to you, then by the end of this buyer’s guide, you will have a full understanding of what they are and how they relate to one another. I’ve broken down the common terms involved with car batteries and jump starters and explained what each feature means and how to determine what the ideal levels are for your vehicle needs. I have given each product an in-depth breakdown of their features, strengths, and weaknesses and assigned each one a nickname that denotes its most outstanding feature for easy comparison among similar models. If you’re not even sure how to operate a jump starter, then check out the buyer’s guide section below. These models all follow the same basic principle, and I have included step-by-step instructions with pneumonic devices that will help you remember what to do. 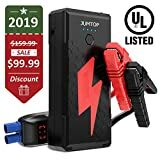 Let’s take a closer look at what makes each of these top rated portable jump starters special. In this guide, I will address some positives and negatives that come with each model, as well as highlighting their distinguishing features. When you finish reading, you should know which one is the best jump starter for your car’s needs. The great thing about the NOCO is that it eliminates the stress involved with remembering to charge it. 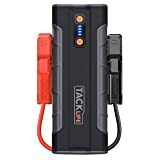 A portable jump starter doesn’t do much good if it’s just as dead as your car when you try to turn it on, and it can be difficult to remember to charge the device regularly to ensure it holds charge when you need it. The NOCO holds its charge for a full year before needing to recharge, so just save the anniversary of your purchase in your phone and tell it to remind you to charge, then forget about it! This also comes with a microfiber storage bag, USB charging capabilities for your electronics, and ultra bright lighting. It boasts capability for up to 20 jumps in a single charge. The GOOLOO jump starter is all about compatibility. This model works on all types of vehicles – even your lawnmower! 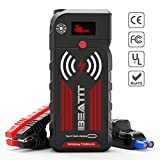 It can be used with 6, 8, and 12 volt cars, trucks, boats, and more. Despite all this, it still fits right into your glove compartment. This model features a charge indicator that lets you know when it needs to be recharged, so you’ll never get a nasty surprise when you need a jump start and your starter is also dead. For optimal use, I recommend charging it once every 3 months. It has a battery life of over 1,000 cycles, so it’s a great option. The Stanley jump starter has been around for a while. It has earned legendary status in workshops for its durable build and starting power. In fact, it will instantly deliver 500 amperes and peaks out around 1,000. Reverse polarity protection prevents sparks and also sounds an alarm to let you know right away that you need to switch the cables. It features a high power work light, USB charging, and an air compressor for your tires. There are power indicators on this model to let you know it needs a charge, but best practice suggests that you should charge once a month. This model is extremely lightweight but still packed with extra features! It utilizes Intelliboost 8 gauge cables with spark resistant safety technology and reverse polarity safety. The Intelliboost advantage also ensures that power won’t flow through the cables until it is safe to do so. This model can jump start around 20 times with a single charge. Because it has a low discharge rate, you only need to recharge about once per year. The Schumacher company has been trusted by professionals for decades. Both mechanics and professional racers use Schumacher products for their cars, including batteries and jump starters. This earned them a spot on our list of top rated jump starters despite the drawbacks of this machine. This is a beast of a jump starter. It was designed for heavy use in professional settings. This makes it one of the longest lasting models on the market. It will continue to function even a decade after purchase as long as you regularly maintain it and recharge monthly to avoid permanent discharge. This has a large multi-use capacity, too. 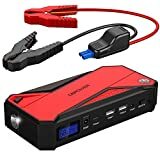 It can charge more times than any other jump starter on the market. It will not overcharge because it is self monitoring, so you can leave it plugged in when not in use to ensure it is ready to go when you need it. Behemoth – so very heavy!! This model is a nice balance of features to value. It carries a peak amp that sits towards the middle of the available ampere range. The weight is also right in the middle – not as light and compact as some but also not a heavy model. It’s got a lot of the basic features, like LED flashlight and a DC outlet, but doesn’t have advanced options for them, like SOS strobes and laptop charging. The extra long cables make it really nice to use, but the wider clamps essentially balance out the cable length because they are harder to maneuver in smaller spaces. If you’re looking for a budget model that balances features to cost and don’t need a ton of extras, then this is the best jump starter for you. This is a great option for those of you who own smaller cars. It is one of the lightest models on the market, weighing less than 1 pound and easily fitting into the palm of your hand. This means that it can’t draw enough power to jump start larger vehicles, but it works great for smaller passenger cars. This model has most of the common amenities, like device recharging capability and a flashlight with SOS beacon. One of the best things about this company is that Britech offers 100% satisfaction guarantees for their products. This means that your device will come with a full 3-year warranty. Their warranty isn’t limited, and there are no strings attached. You also don’t need to worry about redeeming the warranty, because Britech is one of the industry leaders in both innovation and customer service, making warranty claims a breeze. The clamps on the BT-D11 offer tons of great safety features. These have short circuit protection, overcharge protection, reverse charge protection, over temperature protection, and output protection, so that makes this model extremely safe and user friendly. It can start a single vehicle up to 30 times on a single charge. This company also has excellent customer service. They’re easily available and willing to answer any questions about the product any time you need. They also offer a 2-year warranty on the product with a lifetime of customer service. This is a great option for travelers who need some extra security. You don’t have to be afraid of getting stranded in the middle of nowhere, because this can quickly restart your engine. It also offers charging ports for cell phones and other USB-charging devices. It has a compass to help you find your way and a bright flashlight that can double as an SOS strobe in the dark if your battery is beyond saving. The POTEK jump starter is more than just an emergency device for motorists. It’s a great camping accessory! The air compressor includes multiple nozzle attachments, so it can be used to inflate more than just car tires. This makes it ideal for filling air mattresses and sporting goods while camping. It is compatible with a lot of water vehicles, so camping at the lake with boats that have been idle for a while and need a jump charge isn’t an issue. When looking at a list of features, it can sometimes help with the basic statistics but not the comparison knowledge. Many of the best rated portable jump starters share a lot of common features, so they start blending together. How do you distinguish them and get the one you need? A frustrating aspect of this particular market is that there isn’t any consistency in determining specs and features that are important. Several of the options do not include critical information like cranking amps, and none of them explain what each feature is or does. A lot of companies take advantage of novice buyers by featuring their extremely high peak amperage ratings but hide more crucial data like performance and safety features. I have done the research ahead of time to try to answer a few of the most common questions about these devices. This buyer’s guide to the top rated portable jump starters breaks down the common features and explains how they work and what you may need them to do. Before I talk about the different models, let’s tackle a basic question for new users. How does this thing work? If you don’t know anything about cars, this can be very intimidating and scary. You don’t want to spark a fire or get electrocuted. It is important to take your time with this and do it correctly. Before you direct any power through the cables from the charger, make sure to connect the wires. It would be very dangerous for live wires to cross or come into contact with anyone. One common question is which cable connects to which battery terminal. Even experts can mix this up when they rush things or blank on the facts. Just remember that you’d like your car to start if it’s all the same to you. This common phrase holds the key to remembering where to put the cables. If it’s all the SAME to you, then you will remember to connect the positive cable to the positive terminal and the negative to the negative. Another helpful thing is to THINK POSITIVE. Great minds think alike, so if you remember this then you’ll also remember that the same colors go together. Remembering to think POSITIVE reminds you to connect the positive (red) cable before the negative (black) one. Once the cables are secured to the battery, turn on the power. Then, crank up your car. If it fails, let it rest for a couple minutes then try again. Never crank the engine for more than 5 seconds. The jump starters are designed to deliver a lot of power in short bursts, and forcing it to keep going for longer periods of time may cause it to overheat. As soon as your car turns over, turn off the power to the jump starter, and disconnect your cables. Remember to let the engine run for a while so that your alternator can charge the battery. There are several different types of jump starters out there. Here’s a breakdown of the most common types. We have included a few of each model in our list of favorites. Air Compressors: Several models maximize roadside assistance features by including air compressors to inflate tires and prevent flats. These come in handy on long road trips, especially in the summer, where the heat can rapidly deflate tires. These can also be used around the house for increased convenience. Air compressors can inflate rafts, bouncy toys, pool accessories, and air mattresses for when you’re expecting more company than you have beds. 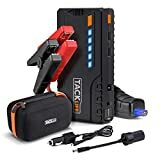 Multi-function Jump Starters: These are jump starters that have more uses than just a battery jump. Several models are capable of jump starting your car, then continuing to maintain battery charge passively to avoid further need for jumps. Many of them now come with USB ports and flashlights as standard options, so you can charge multiple devices on the go. Portable: There is a huge market for miniature models that stow away in the glove compartment. 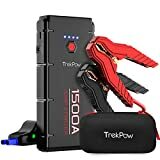 These little jump starters pack a huge punch of power and are capable of starting most light passenger cars on the go. For the extreme version of this, you can sacrifice power for pocket sized models. These are micro starters that can be used for a single jump in emergency situations. There are a lot of different sizes and weights among the best battery jump starters. Determine whether you want to trade some portability and space for features. A couple of our options will fit into the glove compartment, but the trade off is that they offer less power or fewer charges. Some of the chargers are much larger and heavier, but they offer more protections. For these, you sacrifice some of the portability in exchange for a compressor that can fix your tire pressure and a charger with more power. Know how much space you are willing to give your charger in your car, and go from there. If you’re like me, you had no idea what this feature was. 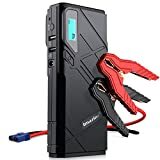 I did some research and learned that this is a fancy way of saying you won’t get electrocuted or end up with sparks flying around if you accidentally connect the negative cable to the positive battery side or vice versa. This feature will often come with a light on the display indicating that you’ve connected them improperly. If there isn’t a light but the charger doesn’t work, then check the cables. Many of them offer silent protection. The ampere level measures your power output. 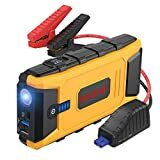 This is extremely important to look into when buying a jump starter. As a rule of thumb, the larger your car is, the more amperes will be required to jump start it. A term you will hear discussed on each model is peak ampere levels. This is the maximum power output capable with this device. The higher the ampere, the more output you receive. When a car dies, it needs to be recharged in multiple places. First, your battery needs enough power to get moving again. Second, there are a lot of essential functions powered by the battery. You will need enough power to start the crankshaft and motor so that the alternator can take over and begin to power your battery. The best way to determine how much power you need to get your car going is by reading your owner’s manual or calling your local dealership and asking about the ampere range for jump starters for your model. Your battery’s specifications should provide the answers. A lot of novice buyers get swindled by the peak amp rating. I was one of them. This is essentially the maximum power output, but it has very little to do with optimal jump start capabilities. What manufacturers look at is the cranking amp rating. The cranking amp rating determines how much power it can generate for about 30 seconds at a time while maintaining the minimum voltage requirements for standard 12 volt batteries. Essentially, this is the ampere rating you will need to look at to know whether you can crank and start your car’s engine for nearly any weather. Higher cranking amps will be better able to start cars across any climate or conditions. Most car jump starters are tested using a standard condition and assuming average climates. If you live in an area where winter lasts all year, you need to check an additional rating. This is called the cold crank amp rating. It’s like the crank amp, but this one is specifically rated for cold temperatures. Voltage refers to the stored energy potential in an electrical system. It’s kind of like the pressure system of the car’s energy. If you remember high school science, this is essentially the potential energy your battery has stored that can be easily converted into kinetic energy to power the engine. For jump starters, this is what moves the electric current from the device to your car’s battery. Choosing the right voltage is easy in this case. Match it to your car’s battery. The majority of passenger cars come with 12 volt batteries, whereas trucks and trailers use 24 volts. It is important to know the voltage information for the product and your car. Current can be a tricky thing to handle, and it isn’t always the safest, either. 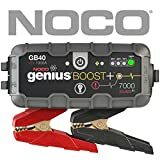 Check under the hood and confirm with your owner’s manual before looking into the best car jump starter, because each one is optimized to specific voltages. Most common vehicle makes and models feature a 12 volt battery. Water sports, ATVs, motorcycles, electric cars, and larger trucks may vary. 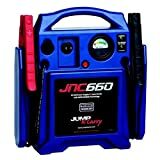 The top rated portable jump starters all come with varying cable lengths. This is a category that is mostly up to personal preference. Experts recommend a minimum of 12 feet of cable. Any more than that is a bonus. A lot of people prefer to set their car jumper on the ground instead of on the car because it makes them feel safer and more in control. This means that they should be looking for cables that are long enough to reach from the ground to the battery without difficulty. Another factor that goes into determining which cables are best for you is the gauge of the wires inside the cables. Resistance plays a large part in circuits and electricity. Basically, the thinner the wires (gauge), the longer it will take to get power to your battery. Unlike amperes, this is a case where the lower numbers translate to higher quality ratings. I do not recommend anything above an 8 gauge cable, because the diameter will be so thin that the ampere rating won’t matter. It won’t be able to get the power through the cables in time to do any good. The optimal rating is a 6 gauge. While 2 gauge cables are even better, they are also pretty pricey, and a 6 gauge is the best value option that can still get the job done. This is a major purchase. It’s important to determine your budget and work from there. Portable options are pretty cheap, but they also have lower power levels and crank amp ratings. Professional grade units come with extended lifetime, loads of features, and plenty of power, but they can cost a lot of money, and most cars won’t need that much to get going. A lot of these options come with tons of additional features. Balance them with your lifestyle. If you can’t road trip without tons and tons of gadgets, then it may be awesome to use the USB features to charge devices. Some of them even allow you to plug your laptops into the car’s power source. Any of the jump starters that have inverters will allow you to plug in your appliances. Another really useful feature is an air compressor. This allows you to add some air to your tires when they get low to avoid flats. It has an extra layer of safety reassurance to avoid roadside emergencies, but doesn’t often come for free. Other emergency functions include flashlights, compasses, and lighting that will flash SOS to flag down anyone who understands the code, or simply light your vehicle to show passersby that you are there, keeping you safe. When using a jump starter, it is important to read the user manual for all safety specifications. Each unit is different and functions differently. Here are some universal practices to enact for increased safety, so you don’t end up in even more trouble. Make sure your battery terminals and connection clamps are always in good condition. They should be free of dirt and decay. Avoid jump starting your car in heavy rain. If this isn’t possible, find a safe way to shield your battery and engine form the worst of the trouble. Keeping water away from electricity is crucial. Water conducts electricity and can make the jump start process extremely dangerous. Thick gloves can also help protect you from any possible sparks and discharge. They will offer a layer of insulation to your hands. Rubber gloves are optimal, because rubber is an insulator. Safety goggles can also protect the eyes, but I understand that your car isn’t a science lab, so these are just some options for those of you who worry more or have less experience. The jump starters on this list all offer reverse polarity protection and anti-sparking safety measures to decrease instances of sparks. Before you start the process, remove any loose and dangling jewelry. There is no reason to let your bracelet or necklace snag on cables or get tangled in the engine. Make sure that your hair is tied back if it is long enough to hang down. Always unplug any accessories in the car. Don’t leave phone chargers and cables attached. The jump start process sends a surge of electrical current through the car, and that can cause these to short out and damage your phones. When you do this, also turn off anything that requires electricity to run. This includes radio, headlights, interior lights, and yes – even your hazard lights. Make sure your car is in park and engage the parking brake. Always connect the red (positive) clamp before the black (negative) clamp. A good way to remember the connection process is to THINK POSITIVE. Great minds Think ALIKE. This helps you remember to connect red to red and black to black. When you Think POSITIVE, you will remember to connect the positive charge (red) first. It is important to use these correctly if you don’t want to permanently damage your car. Placing the cables improperly can short out a lot of fuses and sensors and damage the alternator, so slow down and THINK POSITIVE to connect them correctly. Match your specifications. If you are using a 24 volt system on your car’s 12 volt battery, this is not going to help your car jump faster or more efficiently. It will actually overload your car’s entire electrical system. The products on my list are all rated for 12 volt car systems, but some older models still use 6 volts and don’t have overcharge protections to safeguard against this mistake. The best battery jump starter isn’t always the same thing as the cheapest one. This is a major purchase, and most people are buying it for use in an emergency situation that they hope will never actually happen to them. This means that having a great warranty is important. Make sure you trust the company and their warranty before you make a purchase. I recommend giving their customer service line a call to test their responsiveness and willingness to answer some questions. If this is a difficult process, then trying to redeem your warranty will likely be difficult as well, should the need arise. It is important to remember that jump chargers are not meant to be permanent solutions. If you need a jump because of something like forgetting to turn the headlights off, you should be okay, but otherwise make sure to get your car to a mechanic. The battery may be nearing the end of its life, or your alternator could be malfunctioning. Jump starters are just a quick boost to get your engine powered up; make sure to leave your car’s engine running for a while after you recharge, so that the car’s battery will get back enough power to turn over on its own next time you crank the starter. I hope that this guide has taught you a little more about cars and given you some peace of mind about making your next road trip. You should have been able to narrow my shortlist down to only a couple of products that fit your needs. You’ve learned enough about the features to make an informed decision with the knowledge that every product on this list meets a minimum standard of safety and reliability.